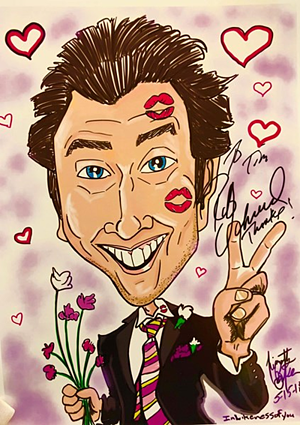 Meet the top booked caricaturist on GigMasters in October - Timothy Baker of Inlikenessofyou! Timothy has been drawing since the age of four and his passion has developed far past the sketchpad. He strives to bring smiles upon his client’s faces and for the past twenty years he has accomplished just that. Without further ado, meet the passionate soul behind Inlikenessofyou, Timothy Baker! Tell us about yourself! How did you get started as a caricaturist? My name is Timothy Baker and I love art! Ever since, I could pick up a pencil, art came natural to me! This gift is very thick in my family’s bloodline! My first taste in the wonderful world of caricatures was back in 2005 when I had the great opportunity to work for a caricature company in Bush Gardens, Florida! Seeing the people of all shapes and ages and getting to create a fun filled experience for them while cartooning them was truly an exciting chapter in my life. When I was about 4 and a half years old, I finger painted my first cartoon which happened to be my favorite superhero, Superman! Now, many years later, I have the great privilege to continue my passion and draw professionally. What do you think makes your style and work stand out from other caricaturists? Firstly, I believe my talent is a gift given to me by God, and for that I am forever grateful. This gift has made me who I am today and I put Him first in all that I do. Secondly, besides the caricatures, my wife Andreea and I offer face painting with bling, temporary waterproof glitter tattoos, real matte ink tattoos, henna tattoos, metallic jewelry tattoos, and air brush painting and tattoos! We are a husband and wife entertainment team and are able to offer more talent to be enjoyed at all kinds of different venues! Thirdly, the part of our service that truly stands out is not only my style of caricatures which is traditional and digital soft or LOL truly funny works of art, but the 5-star service we strive to provide! We want to make sure the clients who hire us are 100% satisfied with the work that we pour our hearts into! Our motto is “Making you smile makes us smile!” We both know that there are not enough smiles in today’s world, so we try our best to help change that by creating smiles wherever we go! After drawing over 10,000 caricatures now and my wife entertaining over 3,000 people, we have come to see that what we offer makes a laughing, great, and joyful difference! 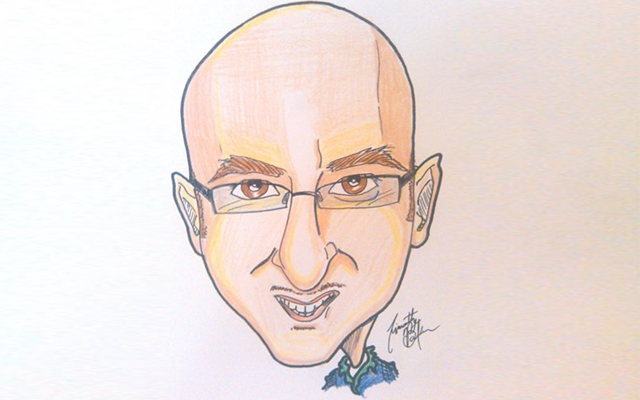 What do you love about drawing caricatures for clients? I love the fun experience with whoever I draw! My heart feels happy when I get time to talk with each person and hear their stories! Their stories help me to create meaningful caricatures for them and knowing when we are done that they walk away with a keepsake to treasure for the rest of their lives makes me feel like I added a little bit of happiness to someone’s life. Do you have a favorite event from this year or one that you're really looking forward to working? I have done many different types of events. From big company parties to small birthday parties, beautiful weddings, and graduation parties, the list goes on and on. I would have to say that one of my favorite events was for Yahoo’s Christmas party last year! This gig was very special to me because Yahoo was the platform my wife and I used to communicate when we first met. Andreea and I met 14 years ago on a missionary trip to Romania. We dated long distance for 2 and a half years through Yahoo messenger and at the party, I was able to share this wonderful story with the CEO of Yahoo. You've been a GigMasters member since 2015 - what advice or tips would you share with new GigMasters members? The advice I would share is to put your client first above the money! When a piece of paper is more important than a human-being, there is a problem. Work with all your heart with the talents you have been given and the result will be happy and thankful clients who you have had the honor to entertain! As we know ‘the early bird gets the worm” so be sure to respond right away to alerts that are sent to you. From the time that you first contact a possible client, establish meaningful communication and show them that you care for them and the request they have for their events! Yes it is a lot of hard work but if you put the effort in, you will see positive results. An entertainer needs to be entertaining! It is not just about the art, it is about the experience you provide. From the first phone call with the client to the closing deal, one must show a professional and profound performance! As far as GigMasters goes, I would highly recommend using them to help you jumpstart your entertaining careers! They have helped me and my wife in huge ways by getting our company out to be seen and heard! I am so thankful to work with GigMasters because it helps us provide for our family and share our talents with the world! Congrats to Inlikenessofyou on a successful month of October! Every month, we choose the top booked member in a certain category on GigMasters to feature on our Inside the Gig blog. If you'd like to be featured, make sure to confirm your bookings every month!